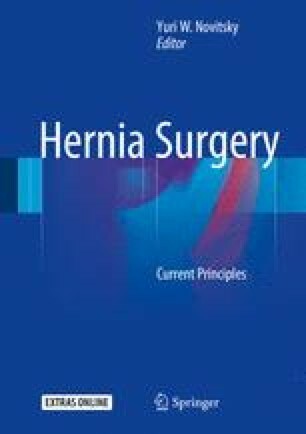 Flank hernias represent an interesting challenge to the general surgeon. These are rare in number but rising in frequency as traumatic avulsions and post-surgical flank complications become more common. The location of the costal margin and pelvic brim limits the fixation options available in the repair of flank hernias and, thus, surgeons have been forced to evaluate other techniques of mesh overlap in the treatment of these difficult hernias. Understanding of the basic anatomy and tenants of operative repair of these hernias however is important for the general surgeon in today’s practice. Smaller defects can be addressed laparoscopically but for the larger flank defects or those associated with denervation injuries, the open approach to flank hernia repair offers the surgeon the ability to obtain a mesh fixation with the appropriate overlap to confidently repair these unique hernia defects. The online version of this chapter (doi: 10.1007/978-3-319-27470-6_18) contains supplementary material, which is available to authorized users.